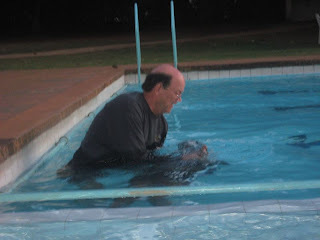 On Wednesday night, Steve baptized two of the team members in the shallow end of the pool at the Kitale Club. 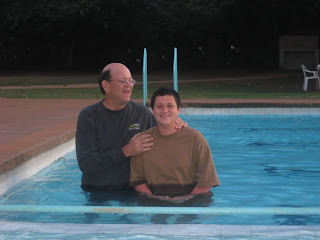 The first was a student named Ian, who had called home to make sure it was okay to be baptized without his parents present. The second was a girl named Hannah. 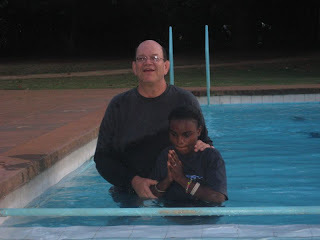 Hannah is Rwandan and Steve met her on one of his visits. 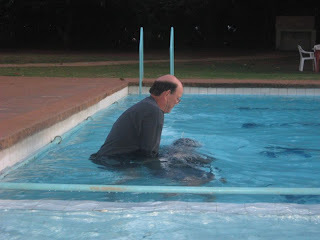 She was a Muslim girl who sat in one afternoon as Steve shared the gospel. When he asked if anyone who like to accept Christ, she stood up. Later, she went home and shared with her brother, Emmanuel, who also accepted Christ. He has been baptized, and now so has she. Just one of the many reasons to love Steve...his heart is huge!